Hi Everyone, It feels like forever since I did a regular card video. Todays project I used the Gypsy to weld 2 shapes together to make a card. I made a Santa card for the Gypsy Spot on Monday so I thought I would show you how make one. If you don't have the Gypsy you can do this with Design Studio as well. Enjoy! Cute card Christina!! Thanks so much for sharing! Love the glitter, really adds to the stocking. Happy weekend, and hope your holidays are the best! thanks for sharing the step by step instructions. Love the card. Also loved the santa card. Hope you don't mind but i borrowed that idea and it really came out cute. Awwhh, you just bought back memories for me! Last year made those cards on my Design studio & I had to make "150" of those cards!! Luckily, they are easy ones to make! Thank you for another great video!! I forgot to say, did you do your own blog?? If you did, I LOVE IT!! That font is adorable!! Very simple & pretty! Love your ideas. Great projects. So darling! Your blog looks great! Very cute. I think I will make that card for all the people at work. Thanks for the idea. Great card and so simple to make. Thanks for the great idea. These look like something I could manage!!! Such a cute card and how good does your blue expression look!!! I just made this card drawing a template, cutting by hand. UGHHHH, so I went and bought the Christmas Cheer and never got around to it. Thanks for the inspiration and making it look so easy. great detailed video...would love to see more like this using the gypsy...I bought it, but haven't used DS before, so I've got lots to learn...you made it look so easy...great card! Very cute. Like the idea of adding glitter. Thank you. Loved your card! You made it look so easy!!! Thanks! 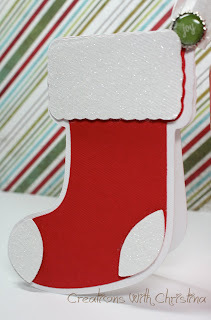 I just love, love, love your stocking card. Your instructions and demonstration was very user friendly. This is so stinkin cute!!! One of the reasons I got the Gypsy was to make shape cards like that and I have NEVER made one....gasp! I am going to give this one a try...thanks for the inspiration!! !